Homemade hard candy is a highly personalized gift perfect for birthdays, weddings, bat mitzvahs, holidays and a wide variety of other special occasions. Creating homemade confections is also a great bonding activity for kids and parents to do around the kitchen table. Hard candy, unlike milk chocolate or other types of candy, are made nearly entirely from 100% sugar, giving them their weight and consistency. By boiling the sugar syrup and adding food coloring or other flavors, the confectioner can then pour the syrup into the mold of their choice. Once the syrup cools, you've got hard candy. Here is a simple recipe for making custom homemade candies of any shape, size, color and flavor. Choose your favorite hard candy mold and lightly spray with baking oil. Combine sugar, glucose and water in a saucepan. Cook over medium-high heat. Use the spatula to stir and to scrape the sides of the pan to prevent sticking. Once the mixture begins to boil, stir with the candy thermometer to get an accurate temperature. Be careful not to touch the bottom of the pan, as that can skew the reading. Once the mixture reaches 300 degrees, remove the pan from the heat. Wait for bubbling to slow down, and then begin slowly mixing in food coloring. Start with a small amount. You can always add more until you get the desired color. Use a dropper to add in flavoring oil. This step will likely produce a lot of steam, so hold your head back as you stir. Use the funnel to pour the hot liquid into the molds. If you’re using a mold designed for suckers or lollipops, immediately insert the sticks an inch or so in after pouring. Set aside to cool. Once candy is near room temperature, you can gently bend the molds to release your homemade candy! Eat your treats right away or wrap them in airtight plastic for later. The candy may become unpleasantly sticky if left out in the open. Once you've mastered the art of making basic hard candy, challenge yourself by adding in nuts or trying some chocolate creations and other recipes. 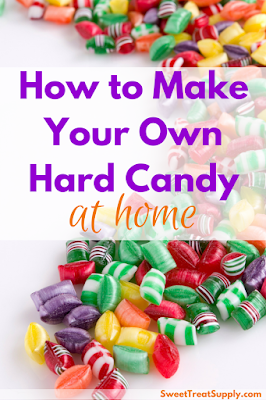 What are your favorite tips for making hard candy at home? Let everyone know in the comments below!